Where Does T&T Offer Construction Services? You know who T&T Construction is, and you know what we do. One question remains, however — where do we do it? While we could suffice it to say that our company proudly offers quality construction services throughout the Houston area, we’ll be the first to admit that Houston is a big place. Our team decided it might be helpful to pare that down for you some. 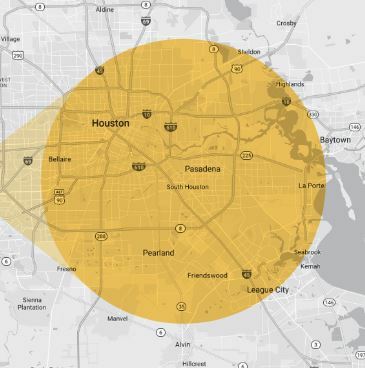 In general, we like to say that our service area spans approximately 60 miles in each direction from our office in Pasadena, Texas. While an approximation remains just that, an approximation, we find that traveling much farther out to tackle a job doesn’t typically make sense. Depending on the work at hand and the equipment needed to pull it off, travel expenses can rack up quickly once you get out past that 60-mile mark, and we try to avoid passing unnecessary costs on to customers. In addition, the farther out we travel, the longer it takes to get to — and from — the jobsite. That not only eats into our crew’s productivity, but it can draw out the amount of time it takes to get your job completed. Throw in unpredictable Houston traffic, and you can see how traveling too far a distance leaves our company open to potential issues. Does that mean we’ll turn down a job if you’re, say, 70 miles out? Absolutely not. At T&T, we are firm believers that rules (with the exception of those put in place for safety) were made to be broken. If we feel the job is a great fit for our crew, and if we believe it is a solid option for all parties involved, we are more than happy to drive a bit farther to get to you. Take a look at the map here for a general idea of the areas we frequent most. Then, if you still have questions, let’s talk! You can always reach us through our website’s Contact page. Just shoot a message our way and a T&T crew member will be in touch shortly. We look forward to working with you!